See that candle on the table there? I've helpfully circled it. Note how incredibly out-of place it is. This is a classy restaurant with romantic mood lighting created by stylish shaded lamps on each table. Yet someone went and ruined the entire effect by plopping a drinking glass with a battery-powered electric candle at the edge of the table. Why would that happen? 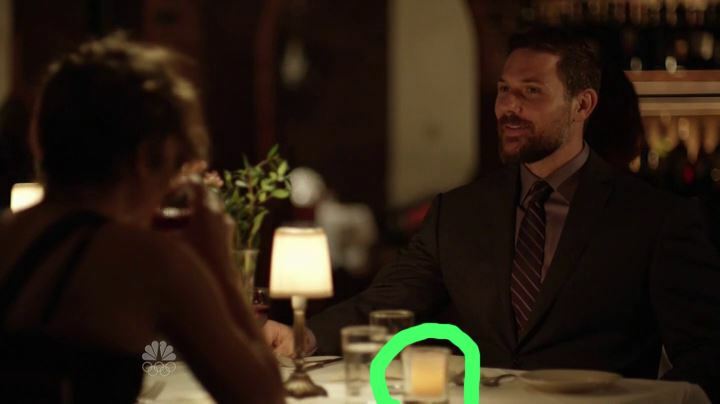 To understand the story behind that candle, you have to hear the dialogue in the scene! We all heard that, right? The DA that J-Lo is on a date with mentioning that it's a date because there was a candle on the table? That line is in the script, so a production person makes a note to get a candle for the scene. There's a tiny bit of discussion about what kind of candle to use, and they wind up going with 'flameless', because that way there's no chance that over an extended series of retakes (TV shows shoot fast, which means lots of quick memorization for leads, and lots of blown line readings) the candle will burn down noticeably. This is how TV shows are made - everyone is in a rush, people barely have a grasp on their lines, and every second lost is hundreds of dollars thrown away. So when everyone gets to the set and finds that the restaurant absolutely shouldn't have a candle on it, they have two options. A: Rewrite the man's line, and have him mention the mood lighting and flowers on every table to establish that it's a date, rather than the candle. Except now you're asking an actor to immediately learn a new line when he's rehearsed it a different way, which guarantees wasted time for everyone but J-Lo, who probably leaves right after they've shot her closeups, leaving the actor to act at an empty chair. 2: Just get a candle, no matter how stupid it may look. Hell, no one's going to notice, right? So obviously they went with option B. I'm not even saying they were wrong to do so, I just think it's an interesting glance behind the scenes of TV production. I have a candle next to my table lamp - ambiance Count, ambiance!